Please use this tool below to calculate your swimming pace for our open water swimming trips! Swimming pace is a measurement of how long it takes to swim a set distance. Usually, it is measured in how many minutes it takes to swim a mile or a kilometre, therefore units are min/mile or min/km. Working out your swimming pace is a useful way to keep track of your fitness and predict how long various swim distances will take you. It is also a useful tool for planning training e.g. you may have a fast pace on short course events which may drop significantly on longer swims. Therefore you may decide to adjust your training to build up more endurance. 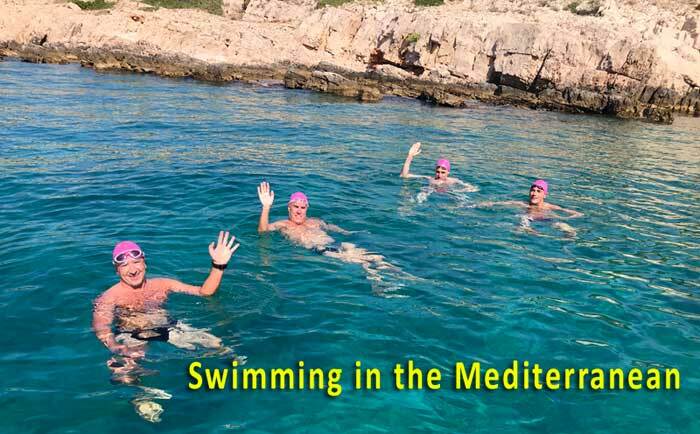 We often have swimmers on our swimming trips who swim at various paces. We are very inclusive and welcome all levels of swimmer, however, if your pace is slower than 28min/km we may need to adjust your swim distance. This usually means you will swim a shorter distance than others but you will be in the water for the same length of time. This ensures you still have a great experience and our guides can ensure everyone’s safety during the swim.